I hope you have a firm grasp on your hats, and that your socks aren’t easily knocked off. Because today, we truly have something special on the docket. Have you ever thought of what you’d do if you came face to face with Bigfoot, swam next to Nessie, or dare I say, set sights on the high beams of a UFO? These are a few of the world’s most perplexing unknowns. With them, some people have convictions; others have doubts. Well today my friends, I have answers. But no, not about hairy beasts or horses with one horn. I’m talking about the wily, misunderstood computer camp. Even though the computer camp has been seen and even experienced in its natural habitat by hundreds of thousands of kids and teens around the world, its existence and purpose still serves as one of life’s greatest mysteries. Such unfamiliarity has led to preposterous myths; strong lies that I simply cannot go another day withstanding. MYTH: Computer camp is "computer camp." Computer camp, as it is popularly known, actually refers to "tech camp," or its more formal name, "technology camp." It also falls under the category of STEM camp, not to confuse matters further (but if you are in fact a bit perplexed, here is what STEM stands for, and here is why STEM is important). All of that said, you don’t go to computer camp to learn "computers." Instead, it's about all things technology: coding, video game design, robotics, design, AI, and more. For the sake of clarity, I’ll continue using “computer camp" for the rest of the post, but don’t let it throw you off track. Like an "outdoor camp" obviously taking place outdoors, there is more going on that the name doesn't always imply. MYTH: Computer campers stay inside. All. Day. Long. Similarly, computer camp doesn't take place in a dungeon. There is natural light, music blaring, kids laughing and collaborating. Games are also being played, and outdoor time and exercise are both normal and encouraged. It's a summer camp after all...just more wires, screens, Roblox, Minecraft, and Fortnite. Completely false. Computer camp is for anyone with an interest in anything, ever. Yes, that’s right. While computer camp might not be the perfect fit for everyone, the far-reaching nature of STEM means that most interests, from sports to the arts, and even monster trucks and beyond can all be taught, learned, and enhanced with technology. Plus..."Geek?" What does that even mean anymore? Point is that computer camp is for anyone who cares to learn something of value during the summer. If it’s considered “geeky” to be curious and impassioned about a topic; and/or dedicated to a craft with an unwavering attention to detail, then sign me up. Download our 2018 brochure to learn more about getting your child started at a "computer camp." Or, continue reading about the many benefits! 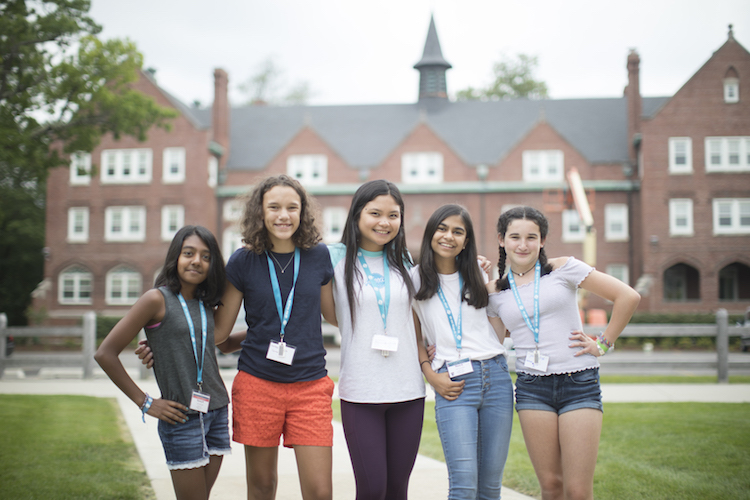 MYTH: Computer camp is for boys…and boys only. False. See above. It's more than a "boy" thing just as it is more than a "geek" thing. Plus, our camper population is currently comprised of 25% girls. It might not sound like a lot, but it’s a number that is increasing every summer as we put more and more resources into achieving 50/50 gender parity. And, have you heard of Alexa Café? It’s a “computer camp” (for an obvious lack of a better term) specifically designed to empower girls in STEM. Thus, computer camps are for anyone who wants to stop simply consuming technology and instead figure out what makes it all tick...so that they can innovate on their own. MYTH: Computer camp is like school, but in the summer. Do school classrooms buzz with excitement, collaboration, and a volume of laughter that borders on being “too” loud? At times, but not usually. Do school students get to produce videos for their own YouTube channels, or build their own apps with Java or C++? Again, not usually. No textbooks, no "teachers" (only tech-savvy instructors), and definitely no homework (only a personally-built project to take home at the end of each session, along with the skills/determination to continue learning after summer ends). MYTH: Computer camp is for kids equipped with Bill Gates-level skills. False. Computer camp is for beginners and advanced learners, with courses that cater to the full spectrum of skills. Plus, at the end of the day, we are still talking about camp (fun, friends, sunshine—things that everyone can enjoy). First-time computer campers can learn just as much as camp veterans. Remember, it’s camp, not school. You can choose whatever course you want, and even take the same course again and again (while learning new things, mind you). MYTH: Computer camp is boring; one dimensional. False. IF computer camp was only a "computer camp," was only for boy geniuses, and was simply an extension of normal, everyday education, then you might be on to something. But, as you’ve been reading, it's different. We are talking about an experience far from any of that. Hopefully with my myth-busting I’ve helped shape skepticism and turn doubters into computer camp believers. If you still have reservations regarding what computer camp might or might not be, I’d love to hear from you in the comments. Want to learn more about iD Tech from others who have already attended? Read our reviews here. Or click the button below to download our 2018 camp brochure.